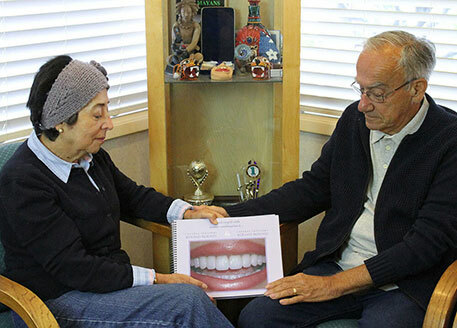 San Jose’s Full-Service Dental Implant & Cosmetic Specialists. Teeth in One Day! Our friendly staff can help you, please call us today! Dr. Cooper is THE clear choice for dental implants in San Jose. Dr. Cooper can create the smile of your dreams from beginning to end. Smile Design is an analysis of several aesthetic factors of your face and mouth that assists us in the creation of the smile of your dreams. In other words, we look at the big picture to design a smile for you that looks and feels completely natural. We will sit down and talk to you about what you would like to change about your smile. Using tools such as digital x-rays, study models diagnostic waxups and computer imaging, we can design the smile of your dreams. There is more to designing a smile than creating perfectly straight teeth. After a comprehensive evaluation of your entire mouth we can help you design the ideal look for you. Dental implants are designed to replace a missing tooth from root to crown so they look, feel, and function like natural teeth. Implants are attached to the jawbone and can be used to secure a single crown, multi-tooth bridge, or full-arch denture, so no matter how many teeth you’re missing, we have a dental implant solution for you. If dental implants have been recommended for you, but you would rather avoid an extended treatment time, Teeth In A Day are possible with All-On-4® technology. The unique All-On-4® system provides structure and stabilization with the placement of the dental implants, making it possible for you to go home that same day with a new set of teeth. The entire process, including any extractions that may be needed, can be completed in a single day. You’ll go home with a fully functional set of teeth that look and feel natural, with minimal recovery time. Dr. Cooper has more than 25 years of experience as a dentist with special training in restorative and cosmetic procedures, implant dentistry, and gum treatment. Our office features the latest technology to make your treatments more efficient and effective, including lasers, digital panoramic x-rays, CAD-CAM, and more. Your comfort is our priority. We offer both oral and nitrous oxide sedation at our San Jose practice. These sedation options are especially helpful for patients who experience anxiety.